Michael B. Platt is a 2007 recipient of the prestigious Franz and Virginia Bader Fund Grant. Long known as a printmaker, Platt now prefers the more encompassing designation, “imagemaker.” His artwork recently has turned to digital imagery and book art that combines image and poetry—fragments, allowing us glimpses of our selves. He continues to create artwork that centers on figurative explorations of life’s survivors, the marginalized, referencing history and circumstance in the rites, rituals and expressions of our human condition. Platt has exhibited internationally and nationally. His latest one-person shows were In Transit, International Visions -The Gallery, Washington, DC, 2007 and Just Above Water, at the University of Maryland, 2006. Numerous private collections have his art in their permanent holdings as do the Corcoran Museum; the Smithsonian Museum of American Art; the Library of Congress’ Prints and Photographs Collection and its Rare Books and Special Collections; the Schomburg Research Center in Black Culture of the New York Public Library; the Yale University Art Gallery; the Harris Poetry Collection of the Rockefeller Library of Brown University; the David C. Driskell Center Collection of the University of Maryland and the Hampton University Art Museum. 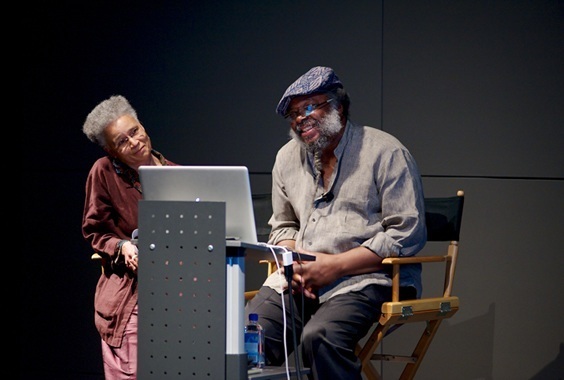 Michael B. Platt and Carol A. Beane discuss their work and various collaborations.